Flipr handles your pool, summer and winter. With Flipr, forget about water analysis, waste of time and dosing errors! Flipr performs for you in real time the analyzes and tells you how to act on your pool. 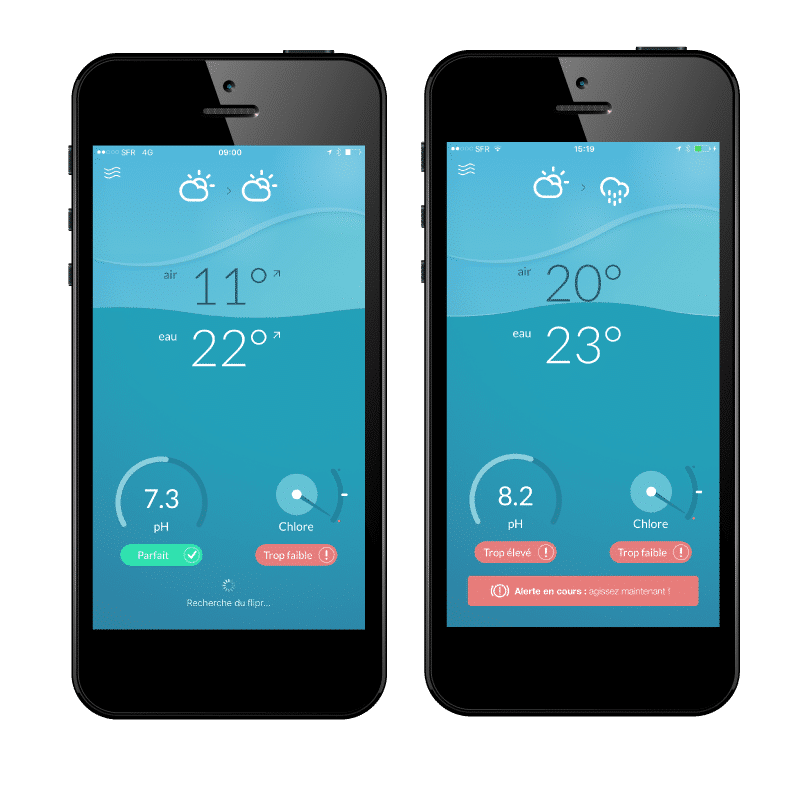 Sanitizer level (Chlorine, Bromine), Ph rate and temperature of the water: all these data are displayed on the FLIPR application. Our algorithms are capable of detecting an abnormality that persists and anticipate water reactions. 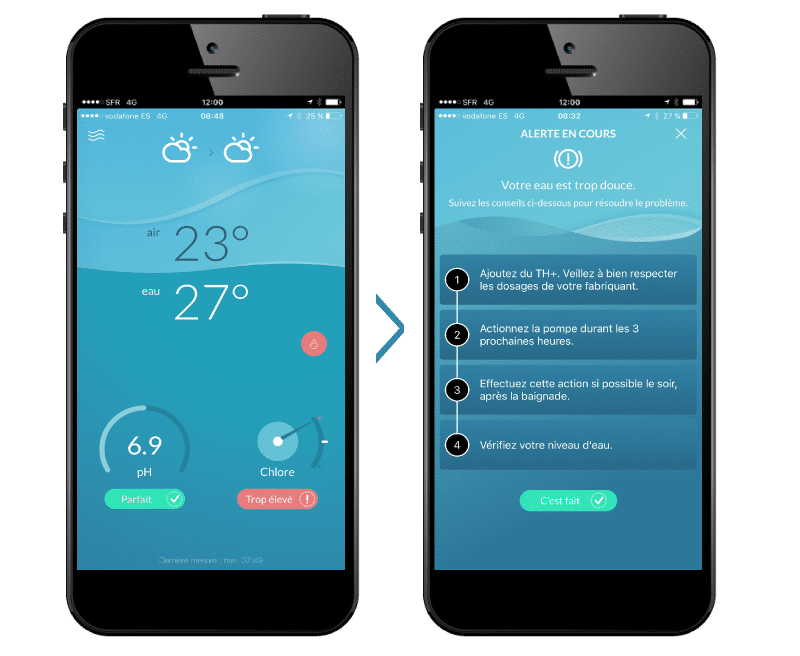 Depending on the results, FLIPR alert you through the application, and gives you the solution to find a healthy pool. CONNECTED WIRELESSLY … AND WITHOUT WIFI! Forget about Wifi and other tricky networks at the water’s edge. 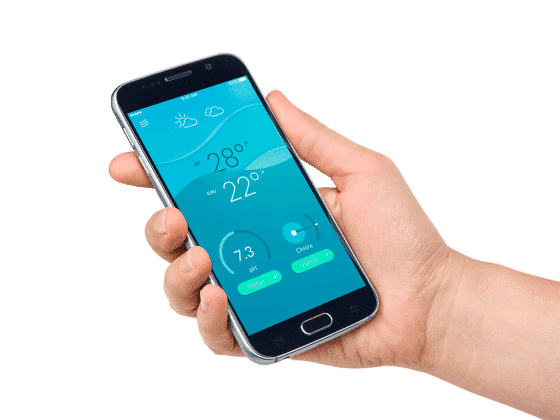 Flipr uses Sigfox IOT network. 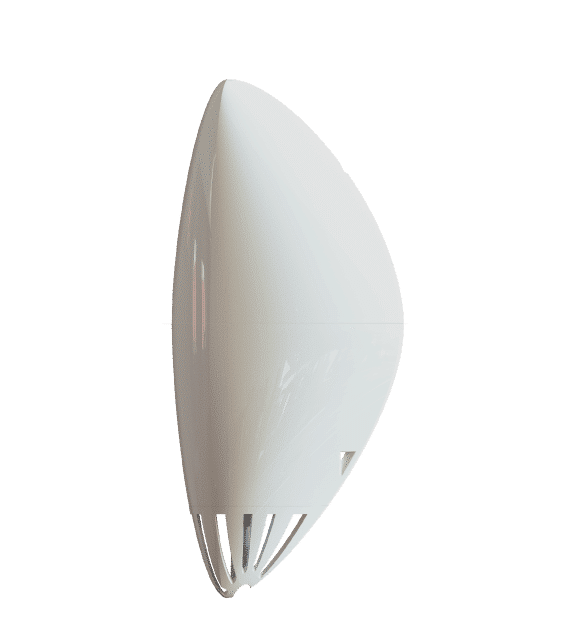 Sigfox is a low-frequency LPWAN network comparable to the GSM network, which allows you to communicate between your Flipr and your app.  Sigfox is available in South Africa. For added convenience, no pairing is necessary: once switched on, Flipr automatically connects to the network and starts sending data. 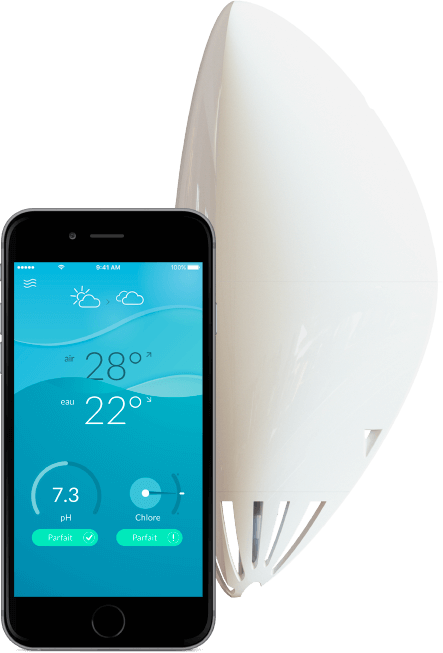 And here it comes : there’s no subscription, we guarantee Sigfox coverage for lifetime ! Thanks to the measures taken by FLIPR and our algorithms, the application makes FLIPR water analysis for you. More time wasted, more dosing errors. You act calmly. Sigfox is available in South Africa, and counting. For added convenience, no pairing is necessary: once switched on, Flipr automatically connects to the network and starts sending data. 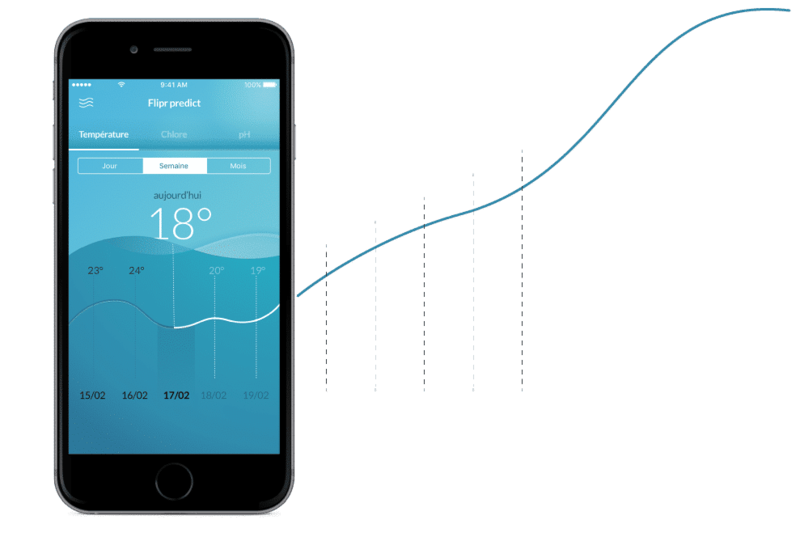 Flipr makes water analysis for you and tells you what to do. Sounds comforting. But we believe that connected objects start making sense as they bring new use, something that the user can not do alone. This is what Flipr does with the predictable data. 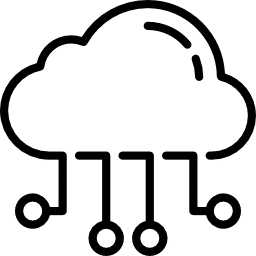 All data collected by Flipr is being analyzed and processed with specific algorithms and compared to history data, as well as environmental and meteorological data. The very simple to use app allows you tracking your pool : water quality, temperature, weather … You have the right information at the right time. Each data is analyzed by algorithms able to forecast water quality over several days. The result: reliable, precise and personalized information to maintain your pool clean. Dashboard allows you to follow in real time your pool. 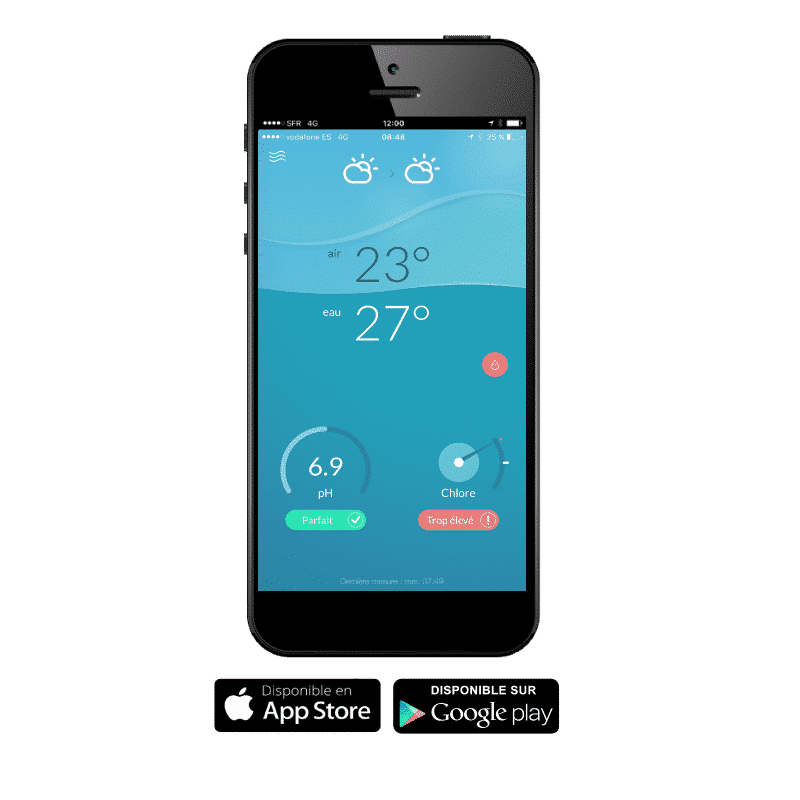 At a glance, you control your pH, your disinfectant (chlorine or bromine), the temperatures with their evolutions, as well as the current and future weather. Low pH? Chlorine too high? A risk of strong wind? As soon as an event occurs, it is clearly marked on the screen. Simply click on it: a notification opens with personalized advice to keep your pool clean and healthy. Flipr does the water analysis for you and warns you when action is required. You will then receive a notification on your smartphone. Each alert is accompanied by clear advice to ensure optimal water quality. Flipr also warns you in the event of a weather hazard (wind, frost, heat wave, etc. ), or any other event related to your bathing comfort. You receive an alert and you can not act? Do not worry: you can postpone the action and perform later as you’re available. During this time, Flipr will continue to update the measures to provide you with the most up-to-date advice. 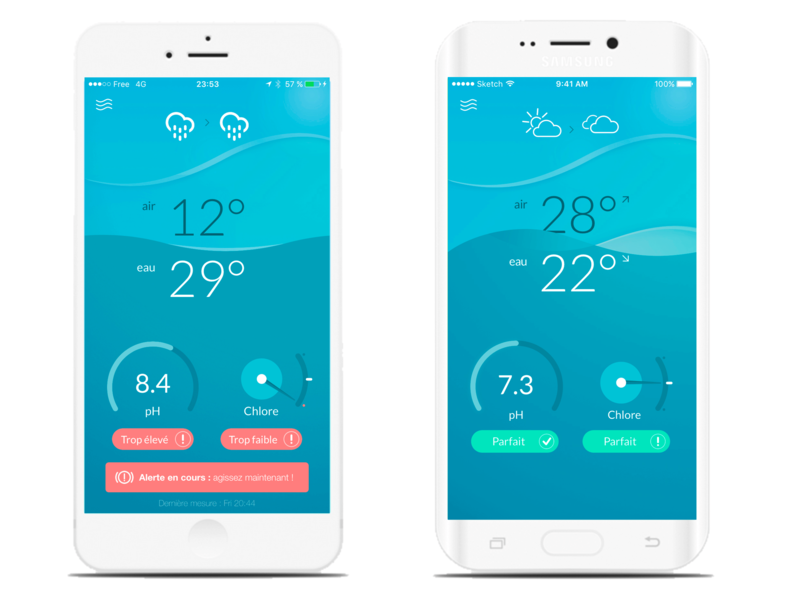 Thanks to a clear dashboard, you can follow different indicators of your swimming pool. Temperature, pH and Redox history are at your fingertips, over several days, weeks or months. Flipr is also able to predict variations. Thus, each history is accompanied by forecasts over several days. An excellent way to predict the best bathing time depending on the water temperature to come! Winter is coming. Flipr is ready! Once the season is over, Flipr will not let you down! 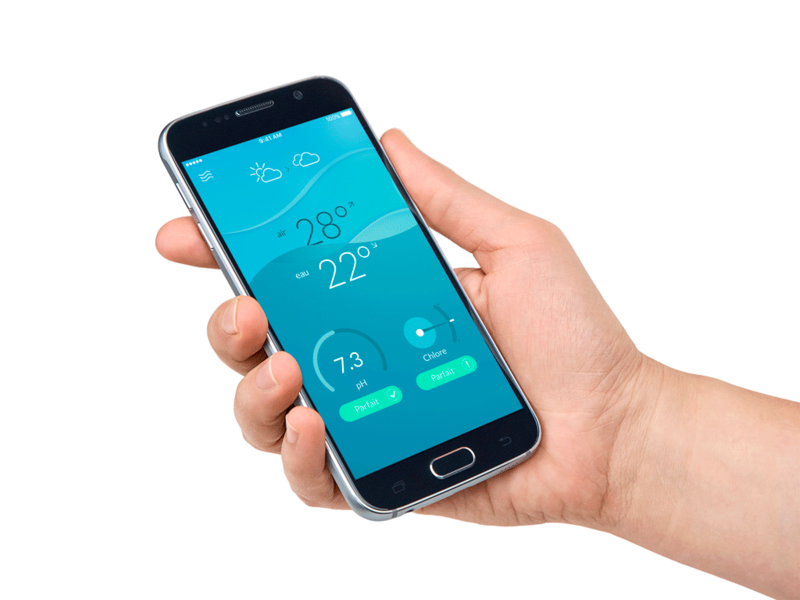 No matter which wintering mode you choose, Flipr will continue to alert you to preserve your pool. It will even tell you when to prepare your pool for the winter … or getting you ready for summer ! Advice on pump operating time depending on water temperature. Freeze Alert (2): Flipr will alert you in case of freeze of you pool and tell you what you need to do to protect your pool. Weather alert and preventive advice to prevent any risk to your pool. Back to summer Alert (2): : Flipr will alert you if there is a risk of frost which could damage the structure of the pool, and will give you the procedure to follow. (1) During the winter, in order to preserve the battery, Flipr adapts the measurement: between 2 and 4 measurements will be taken per day. (2) Flipr sensors are not sutable for frozen water. If there is a high risk of freezing, you will be prompted to remove Flipr from the water during the freeze phase. You cover your pool, you cut everything and wait for spring season : it is a passive wintering (especially recommended for cold areas). In this case, we advise to take Flipr out of the water, and place it in its storage bag. But even out of the water, Flipr will continue to alert you! Freeze Alert: Flipr will alert you if there is a risk of frost which could damage the structure of the pool, and will give you the procedure to follow. Summer alert : : Flipr will notify you when conditions are optimal to restart your pool. Our design team has created an object with fluid lines, perfectly fits in all swimming pools and sufficiently discreet to maintain your yard’s unique setting. Flipr can be attached to the wall of your swimming pool to leave the swimming area free of obstructions and ensure quality analyzes. Our engineers have created a plug and play attachment (sold separately) without drilling. This system allows to adapt without damaging it and is compatible with bubble covers or roller shutters. Designed To Last And Endure. Your pool is a place for swimming and recreation. Flipr has been specially designed to be resistant to your many dives. We have integrated a non-rechargeable battery, capable of powering Flipr up to 3 seasons. Our state-of-the-art sensors, have been the subject of numerous tests and are regularly checked and can last up to 3 years. Flipr is guaranteed 2 years, parts and labor. For more serenity, we offer FliprInfinite, a maintenance package on the first 3 years of your Flipr life. Enjoy Flipr and all of these unlimited features. I really don't regret the investment. We already have a pH and Chlorine regulator. With Flipr it is all perfect ! For the moment I am totally satisfied by Flipr. Congratulations and especially thank you. It's so nice to see that everything is fine for the pool water. Satisfied of my purchase and very good Customer Care, very friendly. The data is displayed perfectly and I just have to read the information on the screen to keep my swimming pool clean and clear ! Thanks again ! At the end of the summer, I can say Flipr is extraordinary: I have an incredible water quality and I've used much fewer products. I did not care much about the pool ... What a treat! I've received my flipr 08/16/2017 : Fast setting, the product is beautiful, well made... it's a good work ! The customer care is very nice and work hard to improve the app. I'm very happy! Really Great ! it's super convenient, it really helps me to manage the pool. The dosage indications are very clear. We went on holiday in July : we could watch the water quality from a distance, and give directions to my parents. Profitez de Flipr et de l’intégralité de ces fonctionnalités en illimité avec nos offres sans abonnement ! Des remises spéciales grâce à nos packs ! Une sérénité absolue grâce à nos forfaits tout compris, et votre Flipr à tarif réduit ! Extend the Flipr experience for absolute serenity. Get absolute serenity with Flipr Infinite. We have designed a package for you that includes the maintenance of your Flipr. In order to offer you an experience without any constraint, we take care of everything: logistics, repair and rebooting your Flipr experience ! Flipr is made up of elements that alter with time, like some sensors or the battery. In order to maintain optimum performance, we recommend to change these components every 2 to 3 years. With Flipr Infinite, the renewal of these components is included in the service. So you enjoy Flipr in shape, at a great rate!